It’s the same old story – As we re-start the year and look forward to another 12 months if you’re still having the occasional cigarette or know someone that smokes, it’s feasible that you may or may not have experienced that annually recurring thought about finally taking the time to quit smoking. If you decided to skip the resolutions side of things this year, a new video published by Public Health England (PHE) might make you think twice about the idea of lighting up and switching to vaping. Released as part of PHE’s Health Harms campaign, which sets out to encourage smokers to quit tobacco in January, we are presented with some pretty shocking imagery to remind smokers of the dangers tobacco poses to our health. Conducting the experiment, Dr Lion Shahab and Dr Rosemary Leonard compare the equivalent of a month’s worth of smoking to that of vaping. Using glass chambers filled with cotton wool buds, we see an apparent contrast between the contents of each jar, as they are subjected to the fumes and vapour that we, the smoker or vaper, may similarly experience. As you can see, the cotton wool that is exposed to cigarette smoke has changed colour completely, covered in a thick black, brown and yellowed residue that we can only assume is being left within our bodies every time we might smoke. In comparison, the vaped buds have barely been affected, but for the exception of some dampening towards the centre of the combined buds. The visual evidence provides the kind of startling wake-up call that’ll leave you waking up in the middle with cold sweats and nightmares of what might be unless we take a stand, stops smoking and start vaping. 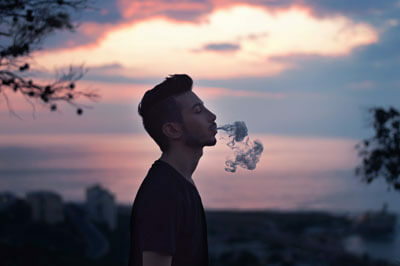 Whilst e cigarettes have not existed long enough in order to determine the long-term effects that vaping may have on the body, in 2015 PHE declared vaporiser devices such as ‘cigalikes’ and e cigs to be up to 95% less harmful than smoking tobacco products and that they have the potential to help smokers quit. In England, it is estimated that there are just over 6 million smokers compared to an estimated 2.5 vapers. A recent survey conducted by Ash, found that of some 6 million smokers, a staggering 44% believed that vaping is as bad for your health as smoking with 22% unaware of how much less harmful vaping is compared to smoking. “The false belief that vaping is as harmful as smoking could be preventing thousands of smokers from switching to e cigarettes to help them quit. I hope this illustrative experiment helps people see the huge damage caused by smoking that could be avoided by switching to an e cigarette”. Smoking is attributed to 16% (77,900) deaths in England every year, which is why it’s so important for this information to spread as far and wide as possible. A lack of education seems the preventative stumbling block that has seemingly stopped e cigs and vaping to be considered a safer alternative to smoking, so if you know someone that smokes show them this blog and video and help them to stop smoking and start vaping.